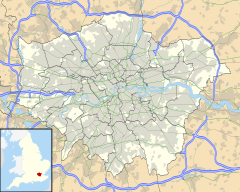 Bedford Park is a suburban development in west London, England. It forms a conservation area that is mostly within the London Borough of Ealing, with a small part to the east within the London Borough of Hounslow. The nearest underground station is Turnham Green (District line), and the London bus routes 94 and E3 serve the district. It has been described as the world's first garden suburb. Although it was not built in the co-operative manner like some later developments (Brentham Garden Suburb, Hampstead Garden Suburb), it created a model that was emulated not just by the Garden city movement, but suburban developments around the world. Sir John Betjeman described Bedford Park "the most significant suburb built in the last century, probably in the western world". Herman Muthesius, the celebrated German critic who wrote The English House in 1904 said, "It signifies neither more nor less than the starting point of the smaller modern house, which spread from there over the whole country." The developer was Jonathan Carr (brother of J. Comyns Carr), who in 1875 bought 24 acres (9.7 ha) of land just north of Turnham Green Station in West London which had been constructed six years earlier. The City of London was only 30 minutes by steam train and the site was blessed with many fine trees. The desire to protect the mature trees led to the informal plan that is major feature of Bedford Park. The first architect for the estate was Edward William Godwin a leading member of the Aesthetic Movement, but his plans came in for some criticism in The Builder, the leading professional journal of its day, and Godwin and Carr parted company. Some designs were commissioned from the firm of Coe and Robinson, but in 1877 Carr hired Richard Norman Shaw the leading architect of his day to be the Estate architect. By then the layout of the Park had been set but Shaw’s house designs, in the Queen Anne style, proved remarkably successful in creating an impression of great variety whilst employing a limited number of house types. In the 1880s with its church, parish hall, club, stores, pub and school of art, living in Bedford Park was the height of fashion. W. B. Yeats, the actor William Terriss, the actress Florence Farr, the playwright Arthur Wing Pinero and the painter Camille Pissarro lived here. Bedford Park is Saffron Park in G. K. Chesterton’s The Man Who Was Thursday and Biggleswick in John Buchan’s Mr. Standfast. So fashionable did it become that Bedford Park came in for some gentle ribbing in the St James's Gazette in the 'Ballad of Bedford Park'. As the 20th century drew on the place became less a centre of fashion; the houses were multi occupied and bus conductors called out "Poverty Park" when they stopped on the Bath Road. The demolition by Acton Council of The Bramptons and its replacement by a five-storey old people's home led directly to the foundation in 1963 of the Bedford Park Society. Through the activities of the society, in 1967 the government listed the greater part of the estate, a total of 356 houses. A few years later both Ealing and Hounslow councils designated Bedford Park a conservation area. Since that time the area has gradually improved. Houses have returned to family use and many have been renovated. The society, a registered charity, was formed in 1963 by two local residents, Harry Taylor – president of the South Acton Conservatives – and architect Tom Greeves who lived in Newton Grove and was a founder member of the Victorian Society. Their concerns about the future of Bedford Park were united by the demolition of The Bramptons in Bedford Park to make way for an old people’s home. Taylor became chairman, Greeves the secretary and John Betjeman the first patron. In the first year the society grew to 200 members who were exhorted not to make unsuitable improvements to their homes. However, Greeves was aware that the only real protection for the whole estate lay in getting the buildings statutorily listed. The breakthrough came in 1967 with the staging of a local exhibition Artists and Architecture of Bedford Park 1875–1900 which was visited by Arthur Grogan, a government inspector from the Ministry of Housing and Local Government. Through Grogan, 356 of Bedford Park’s houses were Grade II listed and the London Borough of Ealing (in 1969) and the London Borough of Hounslow (in 1970) declared conservation areas for their half of the suburb. Tom Greeves, who as secretary was de facto leader of the society for many years, died in 1997. The society has successfully resisted demolition plans and has protected the general architectural quality of the estate and its surrounding area. The society's Log Book, which is issued to every listed house, helps owners learn about the history of their dwelling and how it should be maintained. The society reviews all planning applications and gives its views to the local authorities. The society's main role is to protect the amenity of the first garden suburb. It is not a residents' association, but it does get involved in more general issues such as parking and traffic where these have an environmental impact. The Bedford Park conservation area stretches from Esmond Road in the west, to Abinger Road in the east, from Flanders Road in the South to Fielding Road in the north. Within the Conservation area planning permission is required for most new building work, alterations and extensions. Cladding, new dormer windows and the erection of satellite dishes all require permission. Most of the early buildings in Bedford Park are Grade II listed. This means that the whole building is protected, including the interiors, outhouses and boundary walls and fences. Listed building consent is required for any alterations, extensions, excavations and demolition. All trees in the conservation area are protected and it is an offence to carry out works on a tree without written permission of the local council. The Bedford Park Society is invited by the two local authorities to review all planning applications. The views of the society are taken into account when determining applications. Additionally, Ealing has a conservation area advisory committee which also comments on applications. Richard Briers, English sitcom actor, lived & died at 6 The Orchard. Marie Ault, English Actress of Silent Films, lived at 8 The Orchard. John Lindley, English botanist, lived at Bedford House,The Avenue (Blue Plaque). Jo Grimond, English Liberal politician, lived at 24 Priory Avenue. Cecil Aldin, English animal painter, lived at 47 Priory Avenue. Sir Sydney Cockerell, English Fitzwilliam Museum curator, arts collector, lived at 5 Priory Gardens & 3 Fairfax Road. W. B. Yeats, Irish poet and his father John Butler Yeats lived at 3 Blenheim Road (Blue Plaque). T. A. Greaves, English architect, co-founder of Bedford Park, lived at 12 Newton Grove (Plaque). Beryl Brownsword, English architect & conservationist, lived at 40 Rusthall Avenue (Plaque). Karl Parsons, English stained glass artist, lived at 38 Gainsborough Road. ^ Affleck Greeves, T. 1975 "Bedford Park, the First Garden Suburb", Jones Bolsterli, M. 1977 "The Early Community at Bedford Park : "Corporate Happiness" in the First Garden Suburb". ^ Charity Commission. The Bedford Park Society, registered charity no. 288204. ^ "Karl B. Parsons". Mapping the Practice and Profession of Sculpture in Britain and Ireland 1851-1951. University of Glasgow History of Art and HATII, online database. 2011. Retrieved 29 October 2018. Wikimedia Commons has media related to Bedford Park, London. This page was last edited on 14 April 2019, at 12:15 (UTC).